Polysporan for Pink Eye Review – An OTC solution for pink eye? Does Polysporan for Pink Eye Really Work? One of the most common eye conditions that can occur suddenly in any age group is pink eye. Up until now it usually means taking a trip to the Doctor for a prescription to clear the problem. Now at least for Canadians they can purchase an over the counter treatment which is relatively new which is Polysporan for Pink Eye. Pink eye really is quite a common eye condition and the medical term for it is conjunctivitis. It comes with a lot of signs and symptoms with the most visible sign being the pink or red eye. It is often itchy and sometimes a clear discharge is noted coming from the eye. There are several different potential causes like a viral or bacterial infection, or even allergies. Polysporan for Pink Eye is a treatment for this condition. 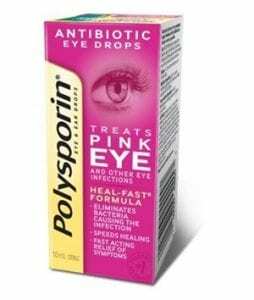 The promoters of Polysporan for Pink Eye believe that their product will correct the condition by following the directions on the package. The indicators are that the product will have to be used as directed for seven to ten days. The hype really focuses around being able to buy Polysporan for Pink Eye over the counter and not having the hassle of going to the Doctors for a prescription. You should easily be able to find and purchase the Polysporan for Pink Eye at your local Canadian pharmacist and it may vary in price slightly. It is also available on Amazon for $24.99 so that gives you a rough idea for what it sells for. The first commitment is to be absolutely sure that it is pink eye that you are dealing with. Pink eye does not create any pain nor does it affect the vision in any way. If you have any doubts that it is pink eye that you are dealing with then you should definitely see your health care provider. You can also talk to your pharmacist about this issue as well. There is no doubt that this type of problem exists and that it is quite common. It can also be contagious so you want to follow all of the proper hygiene precautions to prevent its spread. Polysporan has a very reputable name in the medical industry so there is confidence in their product offering of Polysporan for Pink Eye. Although the Polysporan for Pink Eye seems to be a relatively new product we are going to give it a Thumbs Up based on the reputation of the company itself. We really like the fact that there may be a quick and easy solution to this type of problem without having to go to the Doctors. Again though we caution against self diagnosis, and if in doubt see your Doctor, and speak further about your issue with your pharmasist. We really haven’t reviewed a lot of OTC eye products in the past, but we have recognized that there are some individuals that really have problems with their vision and for a temporary fix they want to buy generic glasses. To address this issue we reviewed the Instant 20/20 glasses so check it out. What do you think? Does Polysporan for Pink Eye work or not? Does the Lauren Hutton Face Disc Really Work? Do Pep Sox Really Work?